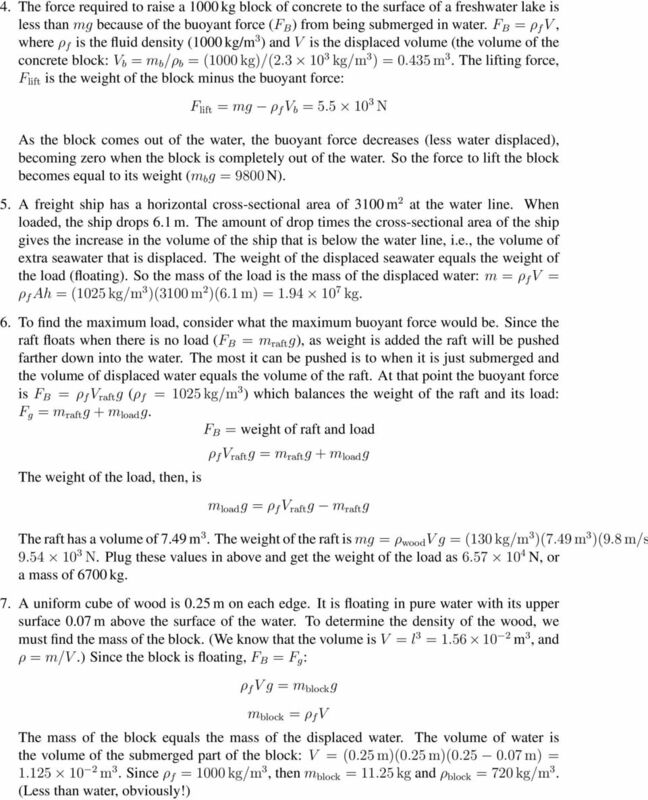 Download "Physics 1114: Unit 6 Homework: Answers"
1 Physics 1114: Unit 6 Homework: Answers Problem set 1 1. A rod 4.2 m long and 0.50 cm 2 in cross-sectional area is stretched 0.20 cm under a tension of 12,000 N. a) The stress is the Force ( N) per Area (0.5 cm 2 = m 2 ), so Stress = N/m 2. b) The strain is L/L 0 = ( m)/(4.2 m) = (unitless ratio) c) Young s Modulus = stress/strain = N/m 2 2. A typical value for systolic blood pressure is 120 mm Hg. Converted to other units, this is (a) N/m 2, (b) 0.16 atm, (c) 2.32 lb/in The arm of a record player exerts a force of N (the weight of 1 gram) on a record. If the diameter of the stylus is cm find the pressure on the record groove in N/m 2 and in atmospheres. (Assume a circular cross-section.) 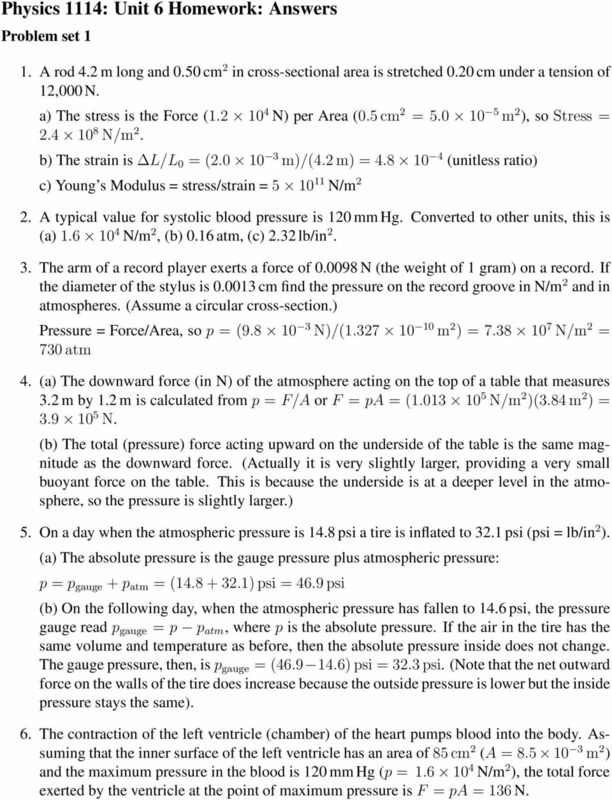 Pressure = Force/Area, so p = ( N)/( m 2 ) = N/m 2 = 730 atm 4. (a) The downward force (in N) of the atmosphere acting on the top of a table that measures 3.2 m by 1.2 m is calculated from p = F/A or F = pa = ( N/m 2 )(3.84 m 2 ) = N. (b) The total (pressure) force acting upward on the underside of the table is the same magnitude as the downward force. (Actually it is very slightly larger, providing a very small buoyant force on the table. This is because the underside is at a deeper level in the atmosphere, so the pressure is slightly larger.) 5. On a day when the atmospheric pressure is 14.8 psi a tire is inflated to 32.1 psi (psi = lb/in 2 ). (a) The absolute pressure is the gauge pressure plus atmospheric pressure: p = p gauge + p atm = ( ) psi = 46.9 psi (b) On the following day, when the atmospheric pressure has fallen to 14.6 psi, the pressure gauge read p gauge = p p atm, where p is the absolute pressure. If the air in the tire has the same volume and temperature as before, then the absolute pressure inside does not change. The gauge pressure, then, is p gauge = ( ) psi = 32.3 psi. (Note that the net outward force on the walls of the tire does increase because the outside pressure is lower but the inside pressure stays the same). 6. The contraction of the left ventricle (chamber) of the heart pumps blood into the body. Assuming that the inner surface of the left ventricle has an area of 85 cm 2 (A = m 2 ) and the maximum pressure in the blood is 120 mm Hg (p = N/m 2 ), the total force exerted by the ventricle at the point of maximum pressure is F = pa = 136 N.
4 Problem set 3 1. a) The surface temperature of the sun: 5160 K = 4887 C = 8828 F. b) The night-time surface temperature of the moon: 173 C = F = K. c) Normal body temperature: 98.6 F = 37 C = K. 2. An aluminum wire 1.4 km long is strung between two towers for the transmission of electricity. a) How much does its length change when the temperature goes from 10 C to 40 C? (α = C 1 ). L = αl 0 T = 1.55 m b) If the wire is 1.4 km long when the temperature is 10 C, how long will it be when the temperature reaches 20 C? L = αl 0 T = 0.93 m So that L = m. 3. An automobile tire is filled to a gauge pressure of N/m 2 at 10 C. After driving 100 km, the temperature within the tire rises to 40 C. What is the pressure within the tire now? Atmospheric pressure is N/m 2. The original absolute pressure in the tire is p 1 = p g +p atm = ( ) N/m 2 = N/m 2. The starting temperature is T 1 = K, and the final temperature is T 2 = K. We assume that the volume of the tire is constant, i.e., V 1 = V 2. Using the ideal gas law: p 1 V 1 = p 2V 2 T 1 T 2 Divide out the volume (V 1 = V 2 ), and solve for p 2 : p 2 = p 1 T 2 T 1 = N/m 2 So the new gauge pressure is p g = p p atm = N/m 2 4. STP means Standard Temperature and Pressure (0 C = 273 K and 1 atm). 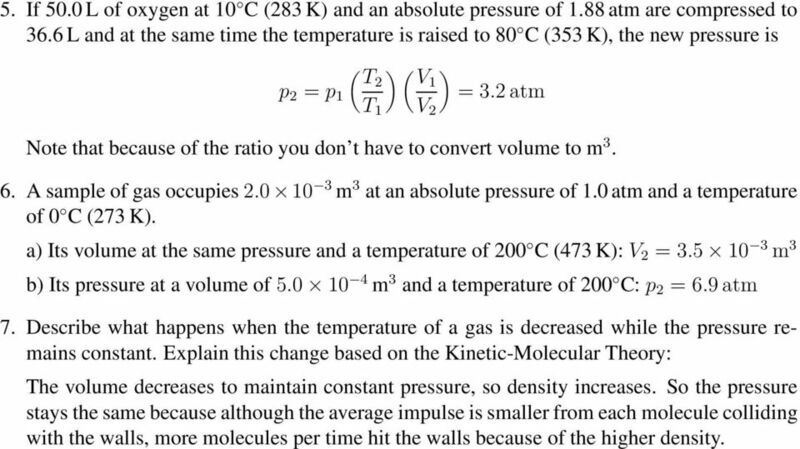 If 5.00 m 3 of gas initially at STP is placed under a pressure of 4.0 atm and the temperature of the gas rises to 25 C (298 K), then to find the final volume we again use the ideal gas law: And solve for V 2 : p 1 V 1 T 1 = p 2V 2 T 2 ( ) ( ) T2 p 1 V 2 = V 1 = 1.36 m 3 T 1 p 2 Note that because of the ratio you don t have to convert pressure to N/m 2, but the temperature must be in Kelvin (absolute temperature). 5 5. If 50.0 L of oxygen at 10 C (283 K) and an absolute pressure of 1.88 atm are compressed to 36.6 L and at the same time the temperature is raised to 80 C (353 K), the new pressure is ( ) ( ) T2 V1 p 2 = p 1 = 3.2 atm T 1 V 2 Note that because of the ratio you don t have to convert volume to m A sample of gas occupies m 3 at an absolute pressure of 1.0 atm and a temperature of 0 C (273 K). a) Its volume at the same pressure and a temperature of 200 C (473 K): V 2 = m 3 b) Its pressure at a volume of m 3 and a temperature of 200 C: p 2 = 6.9 atm 7. Describe what happens when the temperature of a gas is decreased while the pressure remains constant. Explain this change based on the Kinetic-Molecular Theory: The volume decreases to maintain constant pressure, so density increases. So the pressure stays the same because although the average impulse is smaller from each molecule colliding with the walls, more molecules per time hit the walls because of the higher density. Physics 103 CQZ1 Solutions and Explanations. 1. All fluids are: A. gases. B. liquids. C. gases or liquids. D. non-metallic. 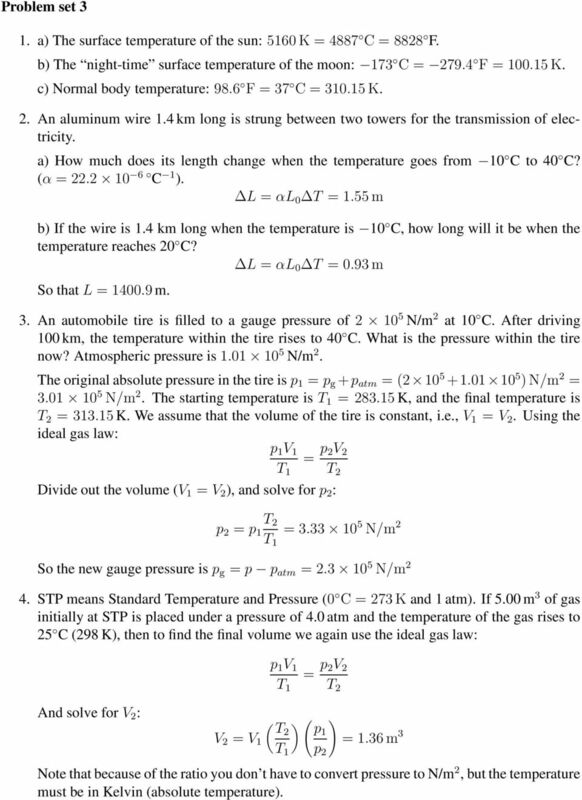 E.
Chapter 17 Temperature, Thermal Expansion, and the Ideal Gas Law. Copyright 2009 Pearson Education, Inc.
Chapter 1 Gas Thermometer and Absolute Zero Name: Lab Partner: Section: 1.1 Purpose Construct a temperature scale and determine absolute zero temperature (the temperature at which molecular motion ceases). Temperature Measure of KE At the same temperature, heavier molecules have less speed Absolute Zero -273 o C 0 K Kinetic Molecular Theory of Gases 1. Large number of atoms/molecules in random motion 2.
δy θ Pressure is used to indicate the normal force per unit area at a given point acting on a given plane. 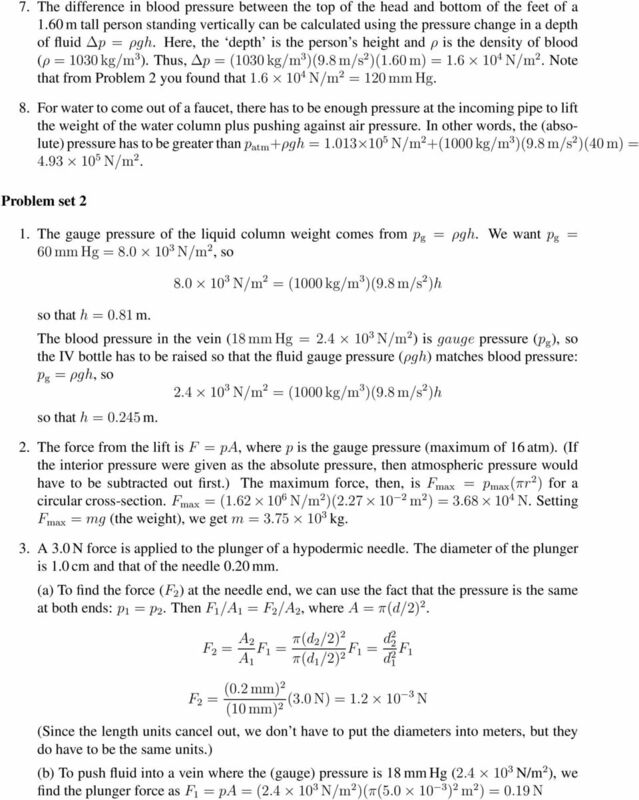 Pressure In A Fluid. GE Define fluid in your own words. 2. Is a liquid a fluid? Is a gas a fluid? Explain your reasoning. An increase in temperature causes an increase in pressure due to more collisions.